This past season ended hard. My last two weeks of heavy work were...heavy. I was mentally bruised and physically exhausted. I didn't have the energy or the willpower to practice, to write, to put food on the table in any caring way. But that was mid-May, and we've been recovering since. I have needed and luxuriated in the time. At this point, I'm finding myself in a great phase of practicing both the oboe and the tarot. This is the thing I love the most about summer - just having the time and space to dig in deep. Last week had long been intended as MY week. I had four days away from home and I'd been looking forward to it for months. As always, I was overambitious about the way I planned to use my time. I packed three books, four magazines. Running clothes. Three tarot decks. And 25 minutes worth of difficult solo oboe repertoire that I couldn't play yet, to be performed in two weeks time in front of hundreds of oboists at the IDRS conference. Mind you, I was in central Illinois to perform with the Peoria Bach Festival, which is not an insignificant time commitment. But anytime I'm away from my home and my family responsibilities I just KNOW that I'll be able to achieve greatness . I accomplished a lot. Of COURSE I'm not exactly ready yet to perform, but the program is coming together. I got a lot done. 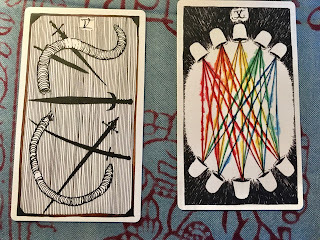 Somewhere in the middle of Friday, though, when I was struggling to drag myself back out of the sunshine and down to my basement practice room, I sat at a picnic table by the river and drew the Five of Swords and Ten of Cups from the Wild Unknown deck. The combination was immediately resonant. The Five of Swords is traditionally about a victory that doesn't feel like one, a short term win that may be a long-term loss. This deck's image of the earthworm cut in half - the enemy vanquished but arising again twice as powerful - reminded me of the pitfalls of unproductive practice time. Sure, you can make yourself practice, but if you aren't enjoying it, aren't actually interested and curious and enjoying the journey, you'll be learning bad habits, or practicing grimness and anger into your music. That felt too close to my last month for comfort. I don't want that. I want the openness, joy, and abundance of the Ten of Cups to be a part of my practice time as well as part of my playing and my performance. I want to approach the oboe with the right mindset. So I finished my walk. I came back to my host's house, took a shower, got a cold drink - and approached the oboe fresh and refreshed. I took some time to meditate before I started to play. I began with long tones that brought focus to my brain as well as to my sound. And then I had a spectacularly productive session, loving the music that I was working on. Could I have gotten there without that message from the cards? Sure. It was an obvious insight. But would I have thought to sit down, take some deep breaths, and consider how I intended to practice? And ponder what was wrong with my mindset? And decide how best to get back in? I love summer. I love the oboe. 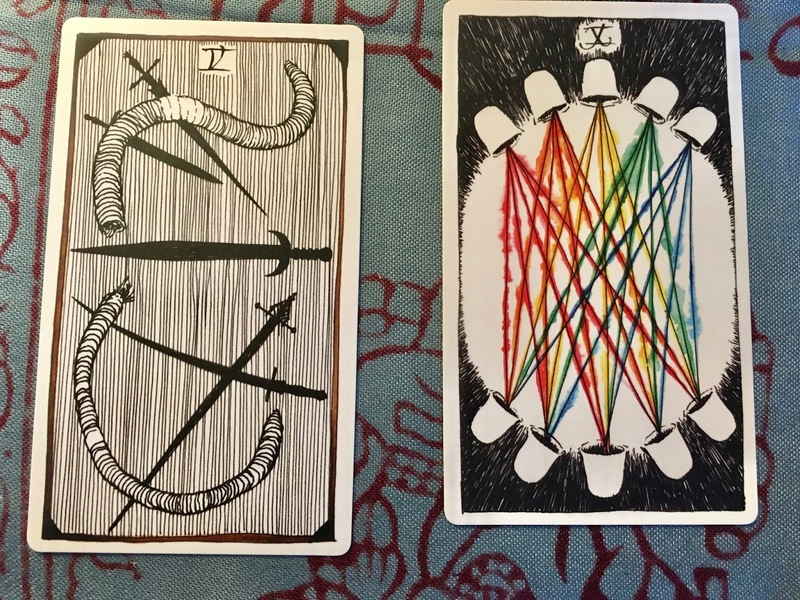 I love the tarot.